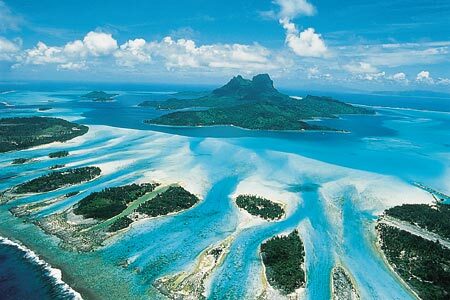 Bora Bora is one of nature’s most inspired creations with a lagoon resembling an artist’s palette of blues and greens. Dominated by two magnificent peaks, Pahia and Otemanu, it has an impressive backdrop of a majestic multi-colored lagoon which many consider the most beautiful in the world. Seen from the air, Bora Bora has been compared to that of a tiny emerald in a setting of turquoise, encircled by a sheltering necklace of sparkling pearls. Life here is casual and relaxed. A place of dramatic beauty, warm waters, and gentle climate. For many travllers, the colorful and majestic setting of Bora Bora offers unlimited possitilites. Honeymooners, and romantics from around the world have laid claim to Bora Bora. From the extraordinary scenery to the privacy and amenities of the overwater bungalows, it is unquestionably the most romantic of the Pacific Islands. This entry was posted in Bora Bora, Destination Wedding and Honeymoons, Hotels and Resorts, South Pacific, Weddings/Honeymoons.